With a lot of work going on on putting pen-plotters in RepRaps for PCBs (and other things), it seemed to me that we might re-visit an old idea. That idea was using oil to assist separation of support material. Now that the Java host software does full overhang support calculations, it seemed that we might combine the two: a pen plotter with an oil-filled felt pen would run over the top layer of the support after it had been laid down to make it easier to break away when the part was finished. Above is a brief experiment I did by hand. The L shape was built 'the wrong way up' forcing it to need support. Both the part and it's support were PLA. I paused the build at the last layer of the support deposition, and wiped corn oil over the support with a Q-tip. Then I resumed the build. 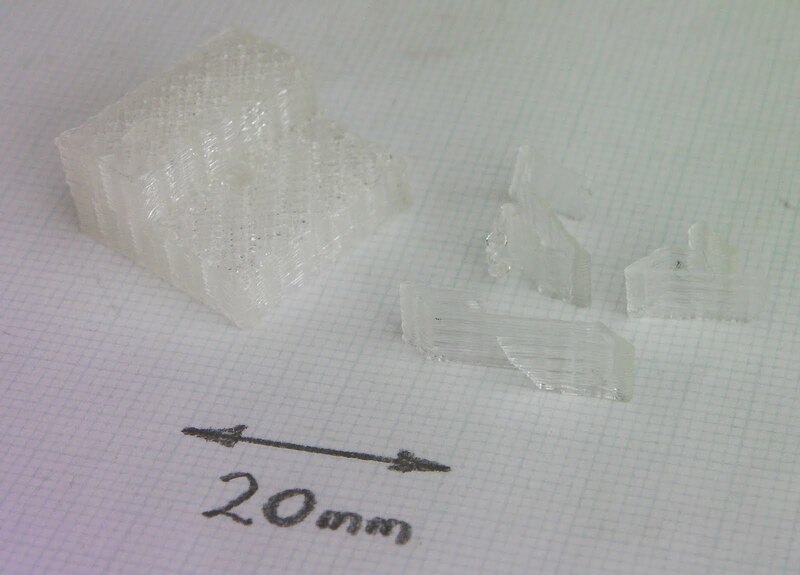 The support material did indeed separate much more easily than it does without the oil. If a support layer was simply plotted twice when it was the last support layer under the part, once with the polymer, and then once with an oil-filled felt tip, this would give the same ease of separation. The same pen plotter could be used with an etch-resist pen to make PCBs, such as these designed to make reprappable electronics simple. Two birds; one stone. Looks very promising. You probably don't need much oil for a large effect. 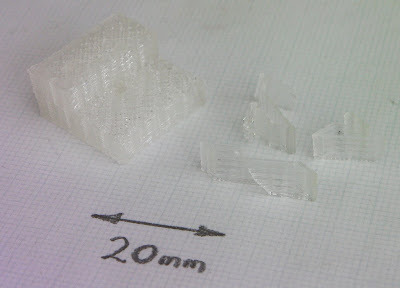 For example PLA sticks to hot glass extremely well but fingerprints make a significant difference. You could place oil where the filament is straight and less or none at corners where the stress is.